(2010 Secret Santa) Bearkiller�s missing and needs to be found before Copper wakes up. �My Beh-tilla!� Copper cried, arching her back away from her father�s embrace and reaching upward toward the family�s den. �Beh-tilla!� she cried again. Farscout was calm as he tightened his hold on his daughter. Freezing rain and snow had made the ground slick, so he walked as calmly and carefully as he could, striding toward Flea. They would be taking enough as it was, between coats, furs, some travel cakes and changes of clothes. Though they were only going to the near hot-springs, Farscout didn�t feel that it would be wise to bring the treasured toy with them. She shook her head and buried her face against his chest, a muffled, �Beh-tilla,� coming from her. �We�ll be back before daybreak, and Bearkiller will be right where you left him,� he promised. By the time they reached the Hot-springs, snow was falling lightly around them. Copper enjoyed watching the flecks of snow gather on her clothes and on Flea�s fur, and Farscout never tired of watching his daughter. He grinned when she looked at him and laughed at the snow on his eyelashes. Her laughter warmed him more than the furs he wore. He watched with quiet joy as Copper dismounted and stood, face-up, letting snowflakes gather on her eyes, nose, and mouth. She laughed again, then headed toward the nearest pool of steaming water. Farscout hurried to catch up with her. Copper was delighted to swim during the winter, and Farscout was happy to witness that delight. He never stopped marveling at the miracle of his daughter � and his lifemate. He wasn�t even surprised by his own desire to stay at home to care for Copper � it was the most natural thing in the world for him. And he enjoyed every moment of it. When the night had grown late and Farscout had told Copper it was time to return to the Holt, she quietly climbed out of the warm water and headed toward the fur he was holding for her. Her attention was diverted, however, by a howl of greeting. Farscout and Copper both looked toward the sound in surprise and happiness, but it was Copper who moved first and fastest. �Mother!� she cried simply, running, bare-skinned, to greet Brightwood. Farscout watched as Brightwood, who had been away with the group of word-hunters, dismounted from her wolf-friend and knelt to embrace their daughter and fold her into her fur cape. He felt like laughing � this was one of countless moments of joy and wonder for him � the pleasure of seeing his lifemate and child, together, happy, healthy, alive! Brightwood smiled at him from where she held a now-shivering Copper close. He smiled back and hurried over with furs and dry clothes, which they worked to get Copper into. Once she was bundled and warm, Farscout reached to take her from his lifemate. Together, the family headed back toward the Holt. Farscout sensed that Copper was trying to stay awake, to hear details of her mother�s word-hunt, but exhaustion claimed her and soon she was sleeping in his lap. The parents smiled as they talked, and Farscout practiced the words Brightwood shared with him. They didn�t make sense -� yet -� but hopefully, one day, they would. prepared to carry Copper to the uppermost parts of the Dentrees where the family�s den was. Brightwood undid the laces of the leather door, and the family stepped inside. �Rill was here,� Brightwood said almost immediately, her nose wrinkling. Farscout added, �And Cinder.� As he lay Copper down on the bedfurs, he looked around. Bearkiller was nowhere in sight. **Bearkiller,** he sent to his lifemate, who suddenly looked alarmed. He wondered if Brightwood was remembering, as he was, her own reaction to losing Bearkiller once � Fawn�s wailing hadn�t stopped until it was brought back. Farscout moved as quickly as he could down the steps and to the gathering den. The Chief�s Den was closest, so Farscout started with Cinder. He excused himself to Windburn , who was busy fletching some arrows, and knelt down to where Cinder was quietly entertaining himself on the bedfurs. The child hesitated before looking up, eyes wide. The hesitation was telling, and Farscout noted the brief flush of color and sensed the increase in Cinder�s rate of breathing. Surely Cinder knew what had happened. **Cinder, where is Bearkiller? ** He sent an image of the toy being in the place where Copper had left it and then another image of its absence. He also shared the experience of scenting Cinder and Rill in his den. Cinder paused, and Farscout wondered if the child would try lying to him. 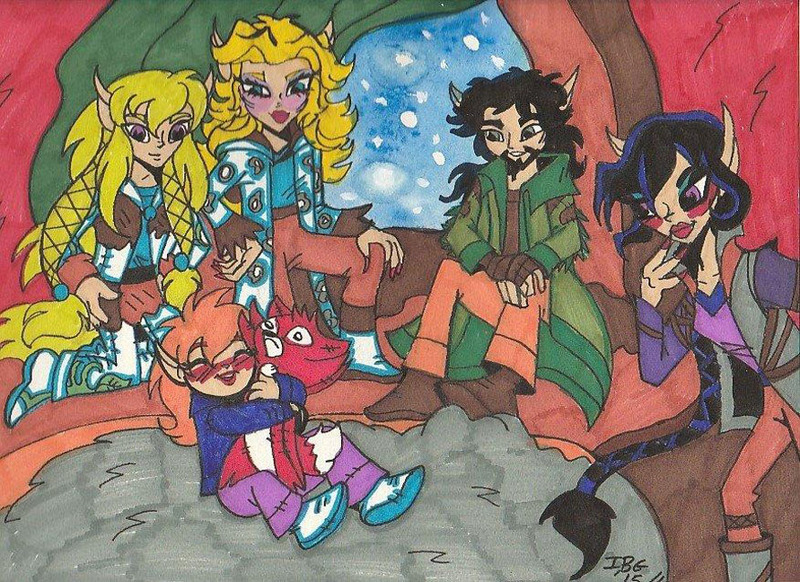 By now, Windburn had joined them and was watching the interaction, but not intervening. **Where is Bearkiller, Cinder? ** he repeated. Cinder looked at his father, then back at Farscout, took a deep breath and let out, �It was Rill�s idea. We snuck in as soon as you and Copper left. We were going to hide it in the Gathering Den, but its leg ripped almost off. We got scared. I didn�t take it, but Rill did - said he�d get it fixed. We were going to put it back before Copper got back. I�m sorry. Please don�t be mad. We didn�t mean to do wrong. It�ll get fixed,� by now, Cinder had tears in his eyes and Farscout believed him. **Next time, leave Bearkiller where you see it, and make sure Rill does the same,** Farscout warned. Cinder nodded solemnly. Farscout stood without speaking and left Cinder to Windburn. It was time to find Rill. He found him quickly. Rill was in his father�s den, sitting against a wall, face downcast. Rill looked up at him. **Cinder said you were coming,** the child sent. Farscout caught the undertones of repentance in Rill�s send, but there was no answer there, and he didn�t see Bearkiller anywhere. **Where is Bearkiller? ** he asked plainly, making it clear to the cub that he wasn�t about to play guessing games. Brightwood�s response was happy but irritated. Farscout was glad he had been the one to go looking for Bearkiller � Brightwood wasn�t always the most even-tempered. Rill and Cinder didn�t really know how lucky they were. Farscout was just happy to know that Bearkiller would be back before Copper woke up. When he arrived, he wasn�t surprised to find his soul-brother there, visiting with Brightwood, but he was surprised to find Copper awake, and playing with her uncle�s hair. �She didn�t want me to let you know she was awake, Farscout,� Cloudfern said apologetically. �and who am I to argue with my niece?� he laughed. Farscout was worried. Surely Copper would want to know where her beloved toy was. Farscout regretted not getting more information from Rill and getting Bearkiller before he returned to the den. They looked at her, wondering. **Wasn't worried,** Copper announced. �Beh-tilla�s all right.� She smiled, then went with her beloved Bearkiller to the furs that she shared with her parents and climbed in. **Sleepy,** she yawned, then curled up and fell asleep, Bearkiller held tightly to her chest. They nodded. They had talked about it before. Brightwood was just waiting to catch the right animal � a red fox - one with a coat of just the right thickness � to replace Bearkiller�s hide. Farscout quietly thanked both Nightstorm and Cloudfern for their help. When they had left, Brightwood turned to him. �Crisis averted,� she said with a smile. Together they laughed, then joined their daughter in the bedbowl. It had been a long night. Time for a silent day.